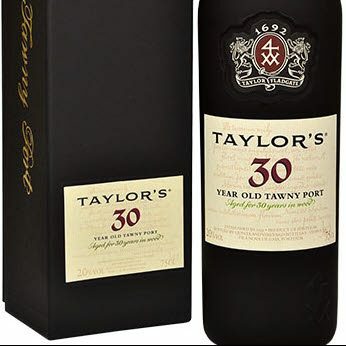 Taylors 30 year old tawny Port gift. An intensely mellow tawny with evolved flavours and aromas of chocolate, butterscotch, toffee and roasted nuts, this wine is rich and voluptuous in the mouth, with a honeyed, layered texture supported by an excellent balance of acidity which carries into the lingering finish A fine 30th birthday gifts. If this is a special gift you can pick the delivery date after you checkout. The NV 30 Year Old Tawny Port was bottled with a bar top cork in 2014. It comes in at 125.8 grams per liter of residual sugar. It isn't that I dislike the 20s or even younger Tawnies, but this shows what you get by stepping up. (Granted, the price is quite a step up, too.) This has that wonderful concentration of flavor, the molasses, the touch of treacle and the extra complexity that you don't always get with young Tawnies. Its combination of power, concentration and complexity also means that it lingers endlessly on the finish. It's one of those wines you will be able to smell on anything it touches for much of the evening. That's worth the price of admission for me. This is wonderfully constructed with that long, intensely flavorful finish. As with most such, it can hold indefinitely barring cork failure, but the bar top cork means that it is not really expected to be aged. Dig in. Make sure not to drink them too warm--60 degrees Fahrenheit or so works a lot better than 72 degrees Fahrenheit.